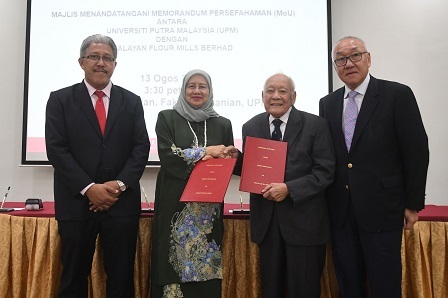 SERDANG, Aug 13 - Universiti Putra Malaysia’s (UPM) Faculty of Agriculture has signed a Memorandum of Understanding (MoU) with Malayan Flour Mills Berhad as a prelude to the collaboration between Malayan Flour Mills Berhad and UPM. UPM Vice-Chancellor, Prof. Datin Paduka Dr. Aini Ideris said through the MoU, Malayan Flour Mills has agreed to finance a closed house system broiler-shed for poultry for the Faculty of Agriculture’s Department of Animal Science. "The cost of building this closed house system is estimated at RM500,000. The closed-poultry shed’s ground work is now underway, and it will be completed by the end of this year," she said. She added that the said collaboration would help UPM to achieve its goal of enhancing the Industrial and Community Network Services as well as strengthening UPM as a Poultry Centre of Excellence. 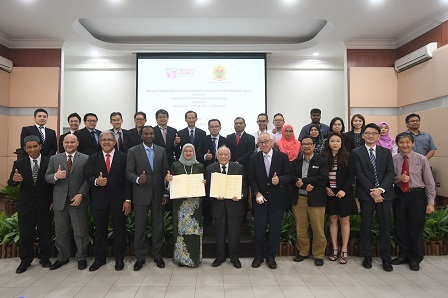 "Researches conducted by experts from UPM with the industries through these collaborative programmes will also help the industries to find solutions to problems in their related field. UPM is always looking for strategic collaborations with both local and international industries," she said. MFM's Managing Director, Teh Wee Chye said UPM has the expertise in livestock sector and is committed in providing assistance to increase broiler production and quality which is in line with Malayan Flour Mills Berhad's goal. "Malayan Flour Mills Berhad will be providing three full scholarships to three Animal Science students beginning September 2019 to study sub-specialisation in chicken production at Arkansas University for one year," he added. The event was also attended by MFM Chairman, Tan Sri Arshad Ayub and Dean of the Faculty of Agriculture, Prof. Dr. Abdul Shukor Juraimi.